Apple's upcoming futuristic drama series "See" gained a new cast member today, with actress Alfre Woodard signing on to play Paris, an advisor and a priestess, reports Variety. Woodard has starred in movies that include "12 Years a Slave," "Annabelle," and "Captain America: Civil War," and she has had roles in several TV shows, such as "Luke Cage," "Desperate Housewives," and "State of Affairs." Alfre Woodard in "Luke Cage"
Casting for "See" began earlier this month with Jason Momoa set to play the lead role of Baba Voss, a fearless warrior, leader, and guardian. Momoa is well-known for his role as Khal Drogo in "Game of Thrones," as well as roles in "Aquaman," "Stargate Atlantis," and "Conan the Barbarian." "See" has been described as an epic world-building drama that's set in the future, with little additional information available on the series at this time. Along with "See," Apple has more than a dozen other original TV shows in the works, and rumors have suggested the first of those TV shows could debut in March 2019. We don't yet know how Apple plans to distribute the television shows, but the Cupertino company may be considering launching a new streaming video service to be bundled with an Apple Music subscription and a digital magazine and news subscription. Nice! This show definitely looks promising! I'm glad they're getting talented actresses on board. Love her! Say what you want about Apple and original content but they sure are getting some capable talent on board! 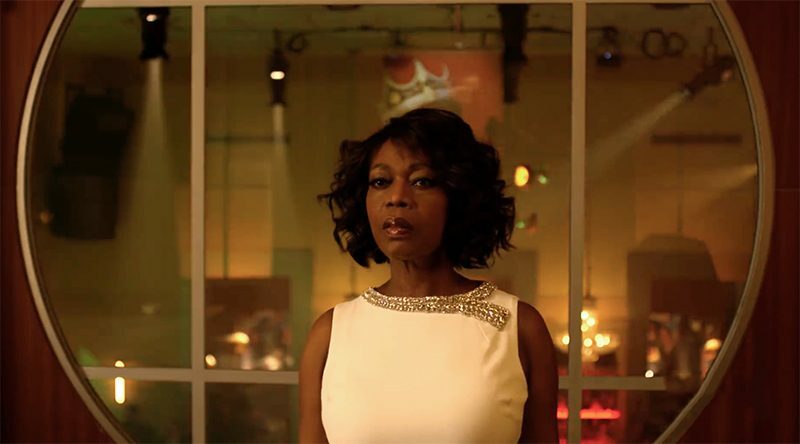 Apple's upcoming futuristic drama series "See" gained a new cast member today, with actress Alfre Woodard signing on to play Paris, an advisor and a priestess, reports Variety ('https://variety.com/2018/tv/news/alfre-woodard-apple-drama-see-1202884314/'). Casting for "See" began earlier this month ('https://www.macrumors.com/2018/07/10/apple-see-series-to-star-jason-momoa/') with Jason Momoa set to play the lead role of Baba Voss, a fearless warrior, leader, and guardian. Momoa is well-known for his role as Khal Drogo in "Game of Thrones," as well as roles in "Aquaman," "Stargate Atlantis," and "Conan the Barbarian." Along with "See," Apple has more than a dozen other original TV shows ('https://www.macrumors.com/roundup/apple-tv/#apples_upcoming_original_tv_shows') in the works, and rumors have suggested the first of those TV shows could debut in March 2019 ('https://www.macrumors.com/2018/03/26/apple-tv-movie-programming-launch-march-2019/'). We don't yet know how Apple plans to distribute the television shows, but the Cupertino company may be considering launching a new streaming video service to be bundled ('https://www.macrumors.com/2018/06/27/apple-streaming-service-bundle-tv-music-news/') with an Apple Music subscription and a digital magazine and news subscription. She's a brilliant actress. Hoepfully the scenario will be up to the task, and the marketing better handled than for Planet of the Apps. Yes! First Contact! Sounds Swedish. Jean-luc, blow up the damn ship! Yep love, love, loved her in Luke Cage. She's awesome! Good to see. The reason I couldnt enjoy watching Luke Cage, so likely the reason I wont eb watching this show.